Sunday’s November 23rd New York Times cover featured a photo of the Washington Square Arch promoing the article, “The Battle of Washington Square,” which prominently appeared on the “City” section cover with an array of photos capturing the park’s illustrious history. The Bloomberg Administration’s push to radically redesign this public space has been under the radar for way too long. However, let me be clear — the issue was never about anyone in the community not wanting repairs, upgrades and a spiffier Washington Square Park. The park needed a renovation as the New York City Parks Department let it fall into serious disrepair. The issues were (and still are) about the Process – how this extreme revisioning of this prominent public space was pushed through – and the Design – what the park’s composition would ultimately be, one that chooses to ignore what actually worked and was successful about the park. When first contacted by New York Times reporter Graham Bowley, I thought … at last the story will be told. And it’s great the story has at last been told. It’s complex and it has unfolded over more than four years. It’s about community and democracy vs. money and power and a government subsumed by its own arrogance. There is still more of the story to be told. 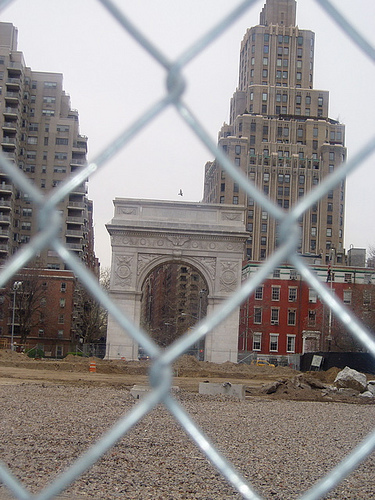 While the Times gives an overview of what’s transpired thus far and reminds us how important Washington Square Park is as a public space, the story still doesn’t quite get to some key facets of the argument, of the timeline, of the nuance, and sidesteps the city’s corrosive and corrupt actions. Outlined below are my thoughts and supplemental information to the article which, overall, is a welcome addition into the dialogue around what’s transpired to date to Washington Square Park. Mr. Bowley, in a way that I’m sure – to his mind – was a vehicle to add color to the article, describes my blog as a way for me to “vent my frustration.” I consider the Washington Square Park blog a place for my writing and p.r. background to be put to good use. An outlet in the so-called “Battle of Washington Square” to: track the process, analyze it, write about it substantively, and advocate for change. I don’t believe that is venting. The use of the word venting feels very old vs. new media. The writer states that the park redesign will cost “$16 million-plus.” Very vague, especially since, Phase I alone, initially budgeted at $6 million is now costing over $13 million – by the Parks Department’s own admission. More than double the projected cost. So, is there any real way that the remaining TWO phases can be anything less than $25 million? In a financial crisis – and really at any time – is this the way our city money should be spent? Perhaps if the piece had not glossed over the lies by George Vellonakis — the “landscape designer” who was given license to alter this historic park with an unimaginative design — to the community; if Parks Commissioner Adrian Benepe was not given a blanket opportunity to make his greenwashing statements about the park being more “green” without a rebuttal; if the Landmarks Preservation Commission and Community Board meetings – which are all on video and which the Times watched – were not just breezed through towards the end of the article, perhaps then, the reader would understand why people might be “bitterly angry,” if that’s even the case. I am glad that Graham Bowley – who assimilated years of information in preparing this story – and the New York Times covered the topic of Washington Square Park’s redesign despite some of the omissions from the piece. “The biggest question people ask is, ‘Why?’ Ms. Swan said. Why are they doing this? I did not say that last sentence. I would never say that. I said, “[some] people do not think a lot can be done” or they don’t know what to do. But that’s not me, folks. I think a lot can be done to maximize and retain the dynamic elements of this public space, still. Tomorrow’s New York Times City section features a cover story “The Battle for Washington Square,” an effort by reporter Graham Bowley to outline what’s transpired thus far around New York City government’s controversial redesign of this renowned park and dynamic public space over the last four years. What’s transpired could be a multi-part series or a book (and is a movie), so it would be exceedingly difficult to get every last nuance into one story. I’m still assimilating the article but a few immediate comments – it’s puzzling that there are no current photos of the park under construction especially because the Times sent a photographer on my September Walking Tour highlighting the redesign elements of the park. The online story only portrays pictures of Washington Square Park in the past which strikes me as a bit, um, odd. The reporter Graham Bowley walked with me through the Park a few months ago. There are a few inaccuracies as far as my comments. For example, Mr. Bowley quotes me as saying of the new exterior fence – currently being installed at 4 feet tall with unapproved “decorative spears” on top, vs. the current height of 3 feet: “That keeps you out. That is very threatening.” Actually, what I said is that it is not welcoming. And I definitely think things can be done from here on. See my further comments: “On Washington Square Park’s Design Going Forward” here. I welcome the New York Times covering the story – the story has been woefully un- (and under) reported to date – and I hope it leads to others. There are so many more pieces of what transpired to be told. And I’d love to hear other feedback from you. I suppose officials always need a scapegoat. But what about when the City official in charge of an agency, say, the Parks Department, knowingly spreads wrong information? What then? The facts: In reality, there’s a 23% reduction of the central plaza in Washington Square Park, according to the blueprints. That’s 23% less room — not even including the reduction in public space due to the reconfiguration of the old fountain, which served as a one-ring circus for performers and protests. “The Community Board approved it,” hammered Benepe — a theme we’ve heard over and over again from City officials like Council member Alan Gerson and Council Speaker Christine Quinn too. In reality, the Community Board rescinded its approval over a year ago, at a meeting April 19, 2007. Said the commish: “That’s not true.” Well, yes, it is. The facts: According to Community Board 5 Chair David Siesko, “Despite all of the public observations, Community Board Board Five has not yet taken a position on the future use of the pavilion”, which the Mayor wants to turn into a private restaurant most likely owned by, or affiliated with, Union Square Partnership co-chair, Danny Meyer. He had just finished a photo op “planting” a cherry tree in memory of 40 years ago when the community blocked Columbia University from building a gymnasium at Morningside Park. We discussed several topics, mostly focusing on Washington Square Park and Union Square Park. I asked Commissioner Benepe about the trees at Union Square Park and the fact that they were being cut down to build a restaurant. He replied, “You’re misinformed. The trees are being cut down for the playground. We’re planting new trees.” I said, “That’s not the same.” He stated, “The trees are dying there. They’d have to come down anyway.” I said, “That’s just what landscape architects say.” (A landscape architect told me, they like to “start fresh” [blank canvas] to work with their own design. Often that entails taking down existing trees.) Commissioner Benepe started relaying his credentials to me to prove he knows about trees. 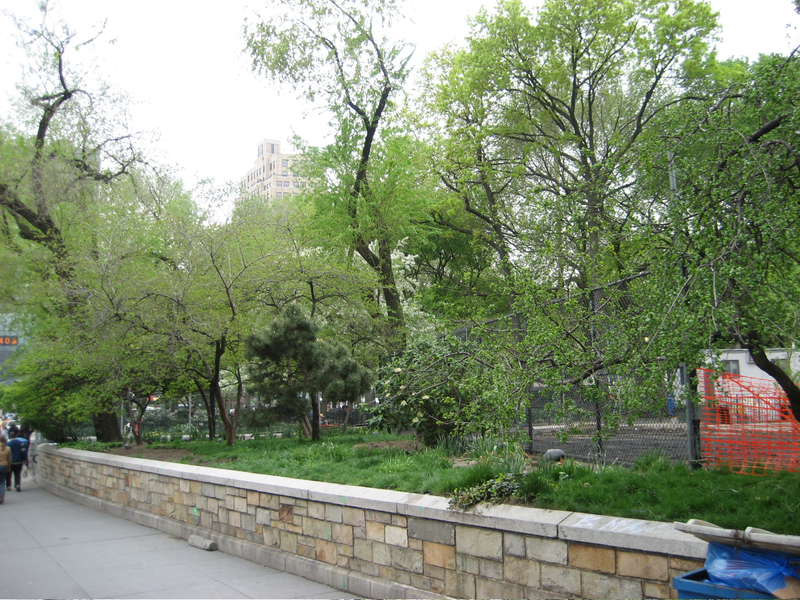 The facts: The photo above shows the very clearly living trees at Union Square Park which Commissioner Benepe was referring to and wants to cut down. NYC Park Advocates’ Geoffrey Croft told me that one tree is scheduled to come down for the restaurant – so it’s not that the tree destruction is limited to the playground. Croft remarked to me when I questioned him about this, “Why can’t they incorporate these really wonderful trees on the East side into the playground design?” — an excellent point. 14 trees are slated to be chopped down at Union Square Park if the City has its way. Presently, a restraining order from the recent lawsuit is in effect which prevents this from happening. At Washington Square Park. 11 trees have been chopped down thus far. In discussing this with Commissioner Benepe, he stated that the trees at Washington Square Park that were chainsawed were all “dead.” This was news to me. I said to him, “Four.” Not all. (According to the Parks Department’s own statements. And even there, they asserted that they were “unhealthy,” not dead.) He repeated back to me, “Four. Right.” Again, he responded: “We’re planting new trees.” I said, “I know that’s what you always say but that’s not the same. Those were mature trees.” Someone else standing near by said that they were 100 year old trees. He said, “They weren’t that old.” I commented that they were 40-80 years old. He nodded. I’d never heard that the trees at either Washington Square Park or Union Square Park were “dead” or “dying” until my conversation on Sunday with Parks Commissioner Benepe. It seems a little too convenient how quick New York City’s Parks Commissioner is to state that trees are dead in our parks when that becomes an easy way to remove them. More on this conversation on Friday.